A: The questions that modern physics does not have answers for, and the physicists believe that it is due to the inability of theories. B - Complex concepts that seem unrealistic, but physicists have admitted they do not know the problems of modern physics. 2 - There are concepts and equations in physics (classical mechanics, relativity and quantum mechanics) that we can use to reach an understanding that is able to be experienced and by which we can review relativistic Newton's second law. 3 - Using the revised relativistic Newton's second law, we can make it easier to express complex concepts in modern physics and respond to many unanswered questions in modern physics. Reconsidering the relativistic Newton's second law is a powerful tool that deepens our understanding of space-time and can be an important step in understanding the nature of interactions and unifying them easier. 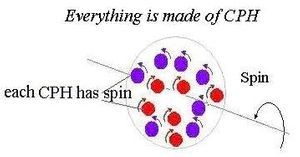 The linear speed in the universe is speed of sub quantum energy (SQE) that is not constant, especially in the expanding time of big bang.